temperature at which a substance changes its state from liquid to gas. A stricter definition of boiling point is the temperature at which the liquid and vapor (gas) phases of a substance can exist in equilibrium. process for drawing heat from substances to lower their temperature, often for purposes of preservation. Refrigeration in its modern, portable form also depends on insulating materials that are thin yet effective. ..... Click the link for more information. processes are based on this principle. the concentration of solutions (most often, solutions of solids in water) by the partial vaporization of the solvent during boiling. During this process the concentration, density, viscosity, and boiling point of the solution are raised. In a supersaturated solution, the dissolved material precipitates out. The boiling point of the solutions is always higher than the boiling point of the solvents; the difference between them, called the temperature depression, grows with an increase in the concentration of the dissolved substance and in external pressure. Evaporation is produced by the introduction of external heat. At temperatures lower than 200° C the heat carrier is water vapor; above 200° C, high-boiling liquids (diphenyl mixture, oil) and fuel gases. Heating takes place through the wall of the apparatus and, in very aggressive mediums, by bubbling gas through the solution or by atomizing the solution in a stream of gas. Evaporation is carried out at atmospheric, decreased, or increased pressure. In most cases it is economically feasible to work under pressure greater than 0.1 meganewton per sq m (1 kilogram-force per sq cm), since it is then possible to use the secondary vapor for heating other apparatus. When working with thermally unstable substances, a vacuum evaporator is used: this makes it possible to lower the boiling points of the solutions and to decrease the heat surface (as a result of an increase in the temperature difference between the heating agent and the boiling solution). A vacuum is created in the apparatus by condensing the secondary vapor and drawing out the uncondensed air-vapor mixture with a vacuum pump. Evaporation is used in the chemical and food industries, as well as in other branches of industry. There are more than 80 different steam-heated evaporation devices. In small-scale production, vertical and horizontal cylindrical evaporation devices heated by means of heating coils or jackets are usually used; in large-scale production there are devices with internal and outflow heating chambers; film devices, in which a stream of vapor draws up a thin film of solution, which creates favorable conditions for evaporation; and devices with forced circulation. The last are used when it is necessary to prevent the precipitation of salts on the heating surface, and also for the evaporation of viscous solutions. In single-shell devices, 1.2-1.25 kg of heating vapor are required to evaporate 1 kg of water. Multishell devices, the most widely distributed of which is the direct-flow type, are much more economical. In this type of device the weak solution and the heating vapor, moving in the same direction, enter the evaporation devices consecutively. In the last device, which is linked to a barometric condenser and a vacuum pump, a partial vacuum is created; as a result of this, the pressure and boiling point of the solution gradually decrease from the first to the last casing. Because of this, a cross flow and evaporation of the solution are created upon heating by the secondary vapor. In reverse-flow devices the solution and the heating vapor move toward each other; in a parallel feed, the weak solution is simultaneously supplied to all casings. In practice there are seldom more than five casings, since the useful temperature differential becomes very small upon further increase. In a three-shell device, 0.4 kg of heating vapor is required to evaporate 1 kg of water; in a five-shell device, 0.25-0.28 kg is required. Multishell evaporation de-vices are widely used in large-scale production requiring a large quantity of heating vapor (for example, in the production of sugar). Kasatkin, A. G. Osnovnye protsessy i apparaty khimicheskoi tekhnologii, 7th ed. Moscow, 1961. Gel’perin, N. I. Vyparnye apparaty. Moscow-Leningrad, 1947. Kichigin, M. A., and G. N. Kostenko. Teploobmennye apparaty i vyparnye ustanovki. Moscow-Leningrad, 1955. Kolach, T. A., and D. V. Radun. Vyparnye slantsii. Moscow, 1963. Lunin, O. G. Teploobmennye apparaty pishchevoipromyshlennosti. Moscow, 1967.
the passage of a substance from the liquid or solid state of aggregation into the gaseous state (vapor). Evaporation is usually understood to mean the transition of a liquid to vapor that takes place on the free surface of the liquid. The evaporation of solids is called volatilization or sublimation. As a result of the thermal motion of molecules, evaporation is possible at any temperature, but as the temperature rises—that is, as the intensity of the thermal motion of molecules increases—the rate of evaporation increases. At a given constant temperature in a closed space or vessel, evaporation takes place until the space above the remaining liquid (or solid) is filled with saturated vapor. The saturation vapor pressure depends only on temperature and increases with it. The curve that depicts saturated vapor pressure as a function of temperature is called the equilibrium evaporation curve (see Figure 1). If the pressure of the saturated vapor that fills microscopic cavities in the liquid becomes equal to or somewhat greater than the pressure in the gaseous phase above the surface of the liquid, evaporation becomes boiling. The highest boiling temperature of a given substance is its critical temperature. 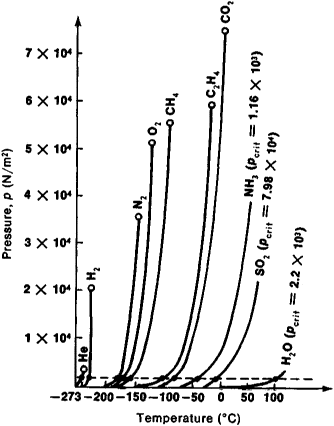 The critical temperature and pressure define the critical point—the end point on the equilibrium evaporation curve. Beyond this point the coexistence in equilibrium of the two phases, liquid and vapor, is impossible. Upon passing from a liquid into a vapor a molecule must overcome the forces of molecular cohesion in the liquid. The work against these forces (the work function) and the work against the external pressure of the vapor already formed are accomplished by means of the kinetic energy of the thermal motion of the molecules. The liquid is cooled as a result of evaporation. Therefore, for the process of evaporation to be isothermic, that is, for it to proceed at constant temperature, a certain amount of heat λ (joules per kg or joules per mole), called the heat of evaporation, must be imparted to each unit of mass of the substance. The heat of evaporation decreases with rising temperature, decreasing particularly rapidly near the critical point, at which it vanishes. The heat of evaporation is related to the derivative of the saturation vapor pressure with respect to temperature by the Clausius-Clapeyron equation, on the basis of which the numerical values of X for liquids are determined. The rate of evaporation decreases sharply when a sufficiently strong film of a nonvolatile substance is applied to the surface of the liquid. The evaporation of a liquid takes place more slowly in a gaseous medium, such as air, than in rarefied space (a vacuum), since as a result of the collisions with gas molecules part of the vapor particles return once again to the liquid (condense). Evaporation is one of the first-order phase transitions, which are characterized by a nonzero heat of phase transition. In the process that is the inverse of evaporation—that is, in the formation of a liquid phase from vapor (condensation)—the heat of evaporation is released. Evaporation is used in technology as a means of purifying substances or separating liquid mixtures by distillation. It is the basis of steam power engineering, the operation of refrigeration units, and all processes used to dry materials. Under natural conditions evaporation is the only means by which moisture is transferred from the oceans and dry land into the atmosphere; it is the main component of water circulation on earth. Kikoin, I. K., and A. K. Kikoin. Molekuliarnaia fizika. Moscow, 1963. Vukalovich, M. P., and I. I. Novikov. Tekhnicheskaia termodinamika, 3rd ed. Moscow-Leningrad, 1962. Konstantinov, A. R. Isparenie v prirode.Leningrad, 1963. Conversion of a liquid to the vapor state by the addition of latent heat. Worldwide, but especially in arid regions, the effects of climate change and rising temperatures threaten to reduce available surface water through enhanced evaporation, especially in surface storage reservoirs. Initially, pressure and evaporation rates increase sharply but become constant once boiling starts. Woven plastic sheets called geo-textiles or landscape cloth allow water and air to penetrate the soil and effectively reduce evaporation. The dissolution of plastic grains in volatile solvents suffered with constant reduction of the solvent amount due to its evaporation . In condensing mode droplet heats up to dew point temperature and in unsteady evaporation mode droplets dispersity is defined. When evaporation energy is scaled up, the researchers predict, it could one day produce electricity from giant floating power generators that sit on bays or reservoirs, or from huge rotating machines akin to wind turbines that sit above water, said Ozgur Sahin, Ph. Have good air permeability to assist in evaporation. The evaporation area has a flexible design to facilitate the introduction of a sputtering source, electron beam gun or gas feeding system as required, utilising a trolley-mounted assembly for easy source exchange. The company claims that its product will save the city hundreds of millions of gallons of water by preventing evaporation. Consider evaporation from an undisturbed water surface, such as that of an unoccupied swimming pool. The prototype captures a small percentage of the energy that could be harvested from evaporation.